North side or South side? Daily, Canberrans wrestle with some difficult choices. The lake-shaped mental block shapes where one lives, eats, shops and drinks coffee. Luckily, The Canberran is not partisan, and Barrister Barista accepts all briefs. This week, we followed the bean train back South, disembarking in the first home of Canberra’s ONA Coffee, on the Lawns in Manuka. Like the centuries-old North and South war, the secondary standoff ‘Kingston vs Manuka’ has the potential to divide a Canberran crowd. Southsiders seem to choose stamping ground based on a melange of preferences: proximity, parking and (perhaps) pastry. Before 8am, there are parks aplenty in Manuka, the suburb sharing its name with honey and its pronunciation with a royal visit. Behind Bougainville St, the Lawns are alive with the sound of breakfast – at more or less originally named eateries (Urban Pantry, My Cafe). It’s a little known fact that our destination owes its fate to Olympic handball, but The Story goes that if Serbia had gone better, Canberra would have gone worse. In another coff-fairytale, a handballer-slash-roaster bought space in Manuka, and went big time (well, big time for East. Aust.). 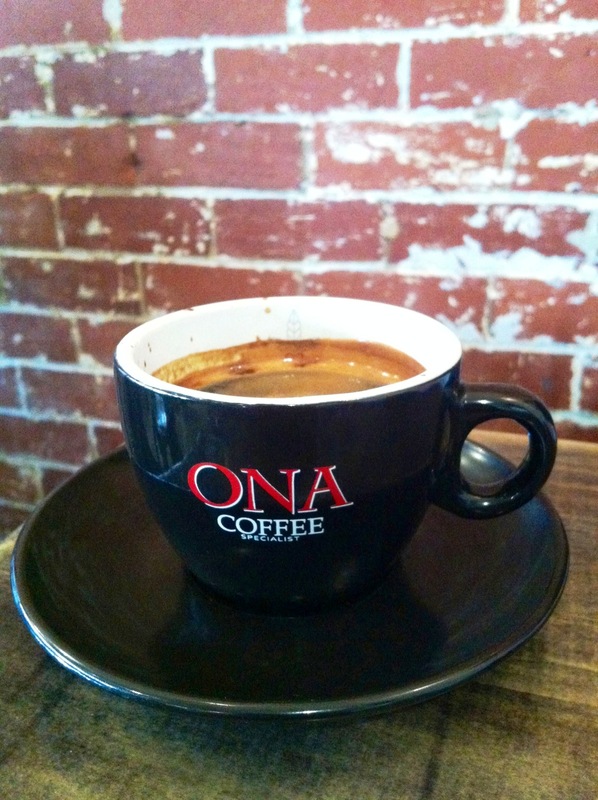 In Canberra, you can drink the now-sought-after ONA Coffee at (Canberra’s best?) Coffee Houses in Fyshwick, Belco and Tuggeranong, and at last week’s blogling Urban Food in New Acton. You won’t know whether to say ONA like ‘my SharONA’, or confuse your friends with the acronym for the Office of National Assessments (O.N.A. ), but either way. We thank you, handball. 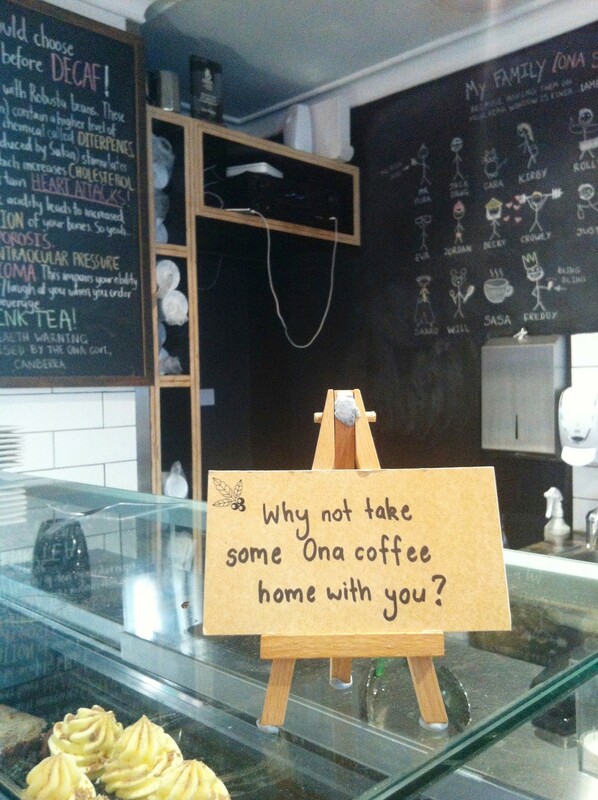 So, what happened when the Canberran ordered coffee from ONA in Manuka? Upfront, we lucked out on The Service, which oscillates wildly between disarmingly gallant and disappointingly absent. Today, doors weren’t opened, and water wasn’t poured, but tables were there for the taking. The Order was placed, of the could-we-trouble-you-sir-to-please-write-this-down variety. We were allowed to hold onto our menus, all the better to admire their comic book stylings, but made The Waiter sad by ignoring The Sides. 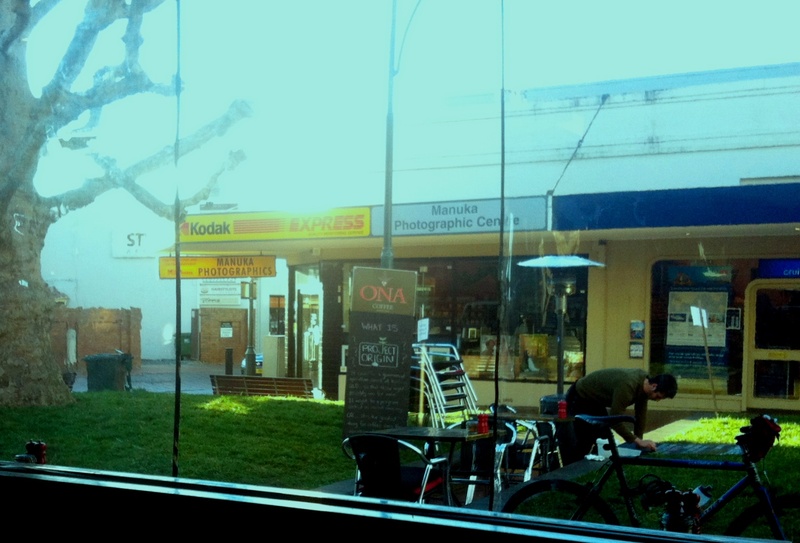 Windowside, and with time to stare, we note that Manuka’s ONA is really starting to develop The Vibe. Now winged by a black plastic verandah, it’s vaguely industrial, but in a whimsical way, not in workday way (cf Harvest). Exposed brick, painted brick, motley wood, paper lighting, posters. With cutesy changing sketches and handwritten signs, it’s DIY decor towards its best. While The Space tries for personality, The Waiter will occasionally try out too much. This is a shout-out to the lady ordering a ‘Regular’ and receiving a Large serve of sarcasm. NB ONA #thecustomerisalwaysright, unless of course two of them are brawling. The Long today demonstrates that milk coffs really are the perfect breakfast. Flat white is creaminess, toastiness, and warmth united in an undersized ONA cup. Believe us, these cups ask to be nestled between your hands. Today, it’s not latte art, but it’s a flat white with heart (gnaaw). Keen to applaud, and keen to keep drinking, we demand The Short (Black) quickly, and sure, it arrives. Just, rather, ahem, slowly. With things to do, people to see, we throw out a cursory ‘Excuse me Sir, did we order..?’ And indeed, we did, but The Barista was just at that moment ‘getting the grind right’. Props, ONA, you’d outsnobbed The Canberran. We wouldn’t argue with the search for perfection… if perfection was what greeted us. Alas, The Short is not worth of trumpets, heralds or angels. Having gulped it down (arghh), we examine its leftover halo – a little crema ring that, imperfectly, carries a bolshy amount of bitterness. Maybe it was just outdone by The Long, or maybe The Barista wasn’t quite awake enough to get Shorty. It’s not a big deal – thus far in Canberra, it seems like the shorter the coffee, the taller the order. The Latte Word: This wouldn’t be an ONA Coffee review without mention of The Hipster Factor. Sure, the patrons are mixed, but the staff are pureblood too-cool-for-school. Their names and caricatures adorn the back corner blackboard, and most of them have won barista championships (in the ACT, but still). They seem to flow somewhat freely between ONA coffee houses, and presumably they engrave coffee beans with their girlfriends’ names in their spare time. They’re making good coffee, and they might feel like sharing it with you. Have you visited ONA baristas in their natural habitat/s? Tell us what you think – is this Fyshwick place all it’s fabled to be?